A few weeks ago, we went camping with our friends, Mark and Erin, plus their little one (named Sophie) and their other little-one-on-the-way (named… whatever Sophie decides to call him this week). This was Sophie’s first camping trip. And for a 4-year-old, this was a big deal! Aside from being “broken up with” by her boyfriend at school last week, that is. In fact, we were worried we might not find a campsite that was available close to home. At which point, we were informed that our camping expedition would, in fact, still take place — it would just be moved to Sophie’s backyard instead! My Tent Is JUST Right… Yours? Just for fun, we took along all 3 tents that we own. The biggest one held Jim, myself, and our big ‘ol dog, Destin. The medium one fit Mark and Erin-plus-one perfectly. 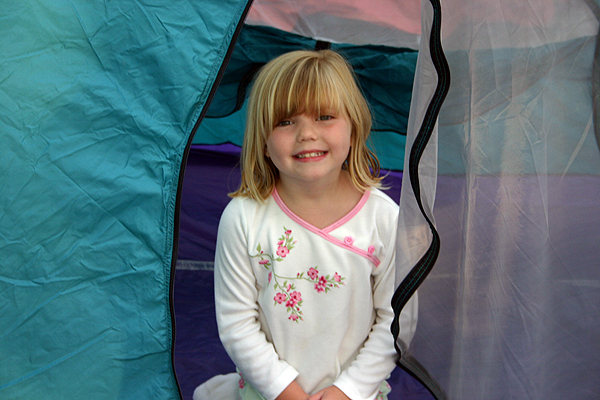 The smallest one was just right for Sophie, and she was delighted to have a tent of her own! It went PERFECTLY with her new white fuzzy bunny slippers and comfy pink sleeping bag & pillow. What it DIDN’T go perfectly with was all the huge daddy-long-leg spiders that kept making their way into Sophie’s little backcountry refuge! She definitely had fun “playing” in the tent during the day. But when it came to sleeping, she managed to stay in there by herself for about, oh… 3 minutes! At which point mom & dad’s 2+1 tent now contained 3+1. 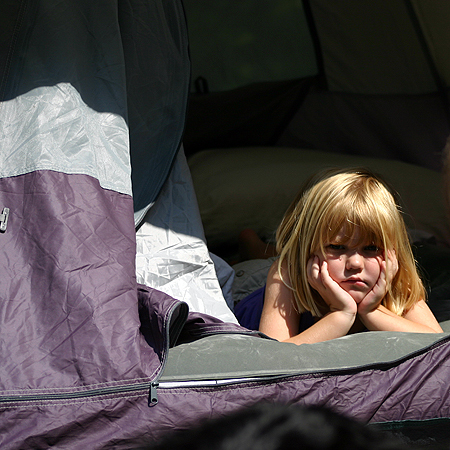 Word is, a bigger tent is in order should we go camping with Sophie & the fam again anytime soon. Like usual, our spontaneity almost got the best of us again… You see, it was on Thursday that we decided to go camping on Saturday. I don’t know if it was because of Father’s Day or what, but EVERY campground at Percy Priest Lake (near Nashville) was booked solid! 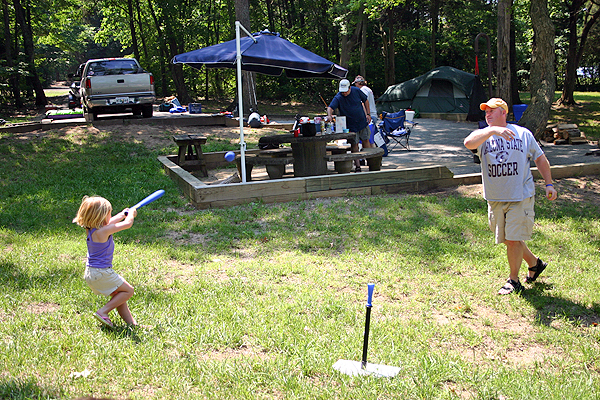 Our only hope was the first-come-first-serve “primitive campsites” at Poole Knobs. Upon closer inspection upon arrival, we all decided that those sites weren’t exactly what we had in mind… it would’ve been near impossible to fit two tents on those sites, let alone three! 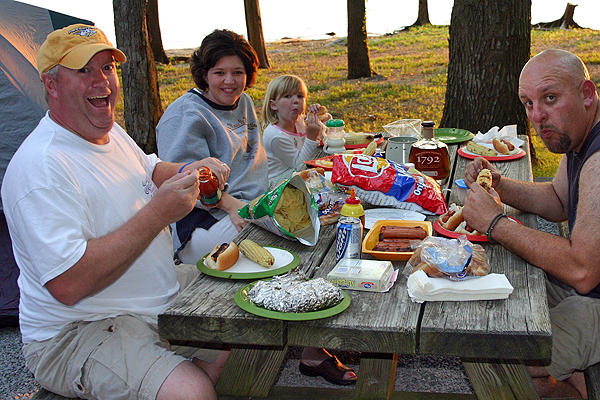 A phone call to our all-time favorite campground at Percy Priest (called Seven Points) revealed that there was a cancellation, but they couldn’t hold the site just for us. So we took our chances and drove the 45 minutes around to the other side of the lake. 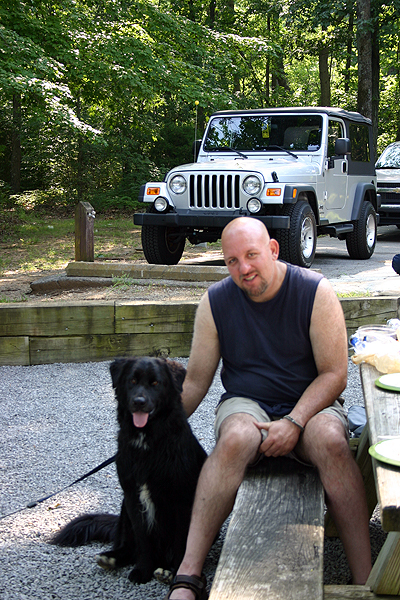 Thank goodness we did… this was the BEST campsite we have ever had in our life! We had what seemed like miles of acreage to ourselves — thus, plenty of room for 2, even 3 tents. 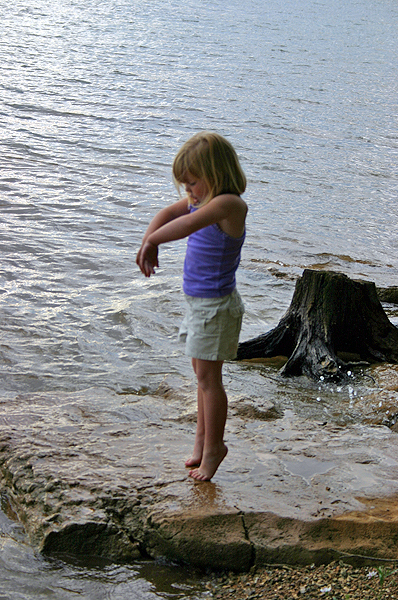 And the best part: this site was one of 10 sites that went RIGHT up to the water’s edge! Yep, we had our own private beach (…minus the crystal-white sandy part). Dogs Are Fun… So Are Babies! We always take Destin with us when we go camping. He’s fun, easy to control, and he has a great time. Sophie enjoyed playing with him too. Except for that one time when he wrapped her up in the dog leash — just as she was running away to play. This little girl and that big dog both had a good time playing in the water… And both were begging to explore deeper waters. The answer was always “No” — Sophie because she had a hard time keeping her footing on the slippery, slimy rocks which lined the shore, and Destin because he would’ve chased the ducks for MILES until he caught one! We stayed up fairly late on Saturday night, SOME of us were imbibing on cold adult beverages and entertaining Sophie with our campfire stories (or rather, BEING entertained by Sophie and HER campfire stories!). After we woke up on Sunday, we were pretty much in lazy-mode all day long. Well, everyone except Sophie, that is. While we were ALL hungry, no one was more anxious for those scrambled eggs (that took about an hour to cook due to inadequate campfire cookware) than Sophie was! It was so cute. In the end, Jim cooked us up a fine breakfast buffet. I’d give it 4 stars. 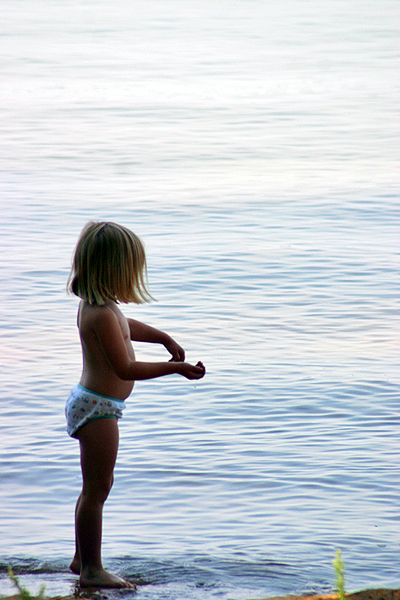 She and Mark spent most of the morning feeding the ducks at the water’s edge. Then, mom got in on the action. Together, they ended up naming all the ducks which frequented our campsite! It was Father’s Day, so it was especially charming to watch Mark and Sophie enjoying their first camping trip together. So What’s With The Dryer Lint?! I informed them that I do NOT, in fact, label all such miscellaneous items around my home. And yes, you can tell perfectly clear that this is lint, just by looking through the clear Ziploc baggie, but this Bag ‘o Lint was photographed specifically for use on our website, and the label as such was simply added for “effect”. So there. 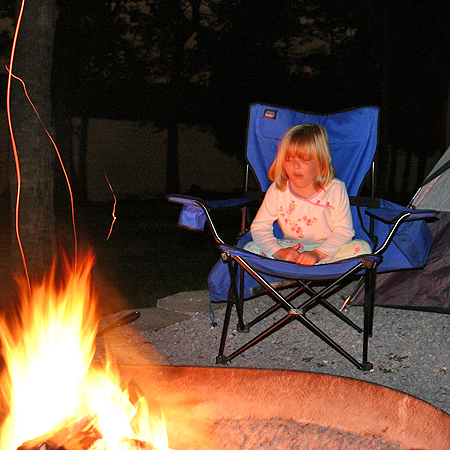 Consider yourself educated about the proper use (and labeling procedures) of good ‘ol campfire lint! In the end, this was a successful camping trip, especially in the eyes of a 4-yr-old. Plus, it was another thing that Sophie’s parents could cross of their list of “New Things To Introduce Sophie To”. 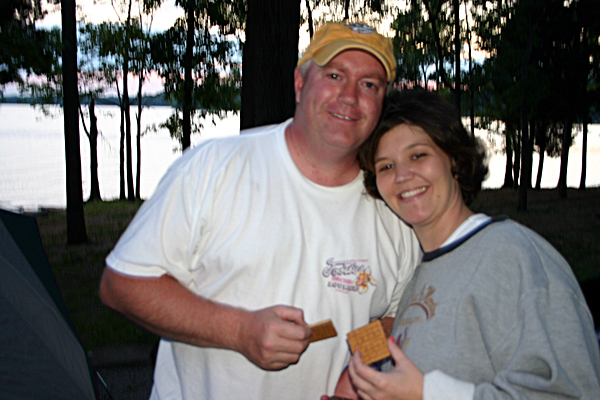 For Jim and I, this camping trip simply gave us the itch to get back out there and camp some more!